Animal Crossing Pocket Camp (Free) brings Nintendo’s gentle charmer to the mobile screen. Anyone familiar with previous entries in the series will feel right at home (if slightly disappointed). For players looking to jump right in but also have some basics on hand, this guide is to give you the best start possible along with what to expect and some things to consider as you play on. Free Leaf Tickets are doled out pretty readily at the start of Pocket Camp. You earn Leaf Tickets by leveling up, completing Stretch Goals, and linking your MyNintendo account. However, you will run out of Stretch Goals to complete, and leveling up becomes much less frequent past Level 15. It’s possible Nintendo will add more goals to complete or events that reward Leaf Tickets, but at launch, you’ll earn somewhere north of 500-600 tickets if you complete all the aforementioned tasks. Five to six hundred tickets sounds like a treasure trove but consider this: the special, limited availability chairs you can craft to host K.K. Slider or (why god, why) Tom Nook at your campsite cost 250 Leaf Tickets each. Speciality designs for your camper van can cost 150 Leaf Tickets per design. You can spend them on speeding up crafting or making up for insufficient materials. Pocket Camp provides varied and many opportunities to spend Leaf Tickets. A second crafting slot – You get one crafting slot from the beginning but with timers that stretch upwards of 7, 10, and 12 hours, just one slot can feel limiting. A second slot is not very expensive and provides flexibility for you to keep crafting. You can spend Leaf Tickets on a third crafting slot but it isn’t as critical as the second. Supplementing shortfalls of rare materials – Requirements for the late-game amenities get pretty steep and running out of rare materials (like Essences) become a real possibility. Leaf Tickets can make up for it but they will often run at least 100 Leaf Tickets, if not much more (depending on how short of materials you are). When your animal visitors are hitting their level caps, it’s best to spend a little to unlock that next amenity. More Inventory Space – Consider this an optional recommendation. If you don’t want to janitor your inventory, go ahead but it’s 20 Leaf Tickets for only another 5 spaces. I’m okay with having to manage my inventory a bit more but some players aren’t. Pocket Camp will get you setup with a Mii-styled avatar right off the bat. After setting up your basic appearance, the game will ask you to pick a personality type. It doesn’t matter what you choose. It won’t have dire consequences later on. It essentially just sets your clothing appearance. You can’t change it once you select it though so take at least a moment’s pause to pick one. The most important crafting material early on is cotton due to all the first-tier amenities requiring it to craft them. Amenities unlock the level caps on your visitors and you’ll hit the first cap within the first couple of days of play so crafting them is priority #1. The best way to get a bushel of cotton is to make friends with the locals. Every animal visitor rewards your efforts to improve your friendship with a particular crafting material. If a visitor hands over cotton, mark them as a favorite in the Contacts screen and do everything they ask of you. Also, get to work crafting the stuff they want to see in your campsite. The goal is to get your relationship with them leveled up quickly so you can invite them to stay at your campsite. This makes them available to chat and makes requests from them much, much more frequent. Once you unlock all the second-tier amenities, you can diversify away from cotton. While pulling Squid and Pale Chubs out of the water, you’ll occasionally come across a Red Snapper or Rainbow Trout. What does an intrepid player do with these rare finds? First off, know that some rare catches are rarer than others. Red Snapper, Black Bass, and Horned Dynastids are treated as rare but are really just uncommon. If you catch one of these, hold onto it but if you have several and need to sell one to make room, it’ll be okay. Any other bug or fish you catch that the game calls rare is, in fact, a rarity. I’ve only ever caught two specimens of Tuna in all the time I’ve put in so far (an unhealthy amount, I assure you). I only ever saw an Emperor Butterfly once. The real tip is to hold on to these finds until you get to the middle- and late-game. Once you get your animal visitors to around level 10, they’ll start requesting the uncommon fish and bugs. 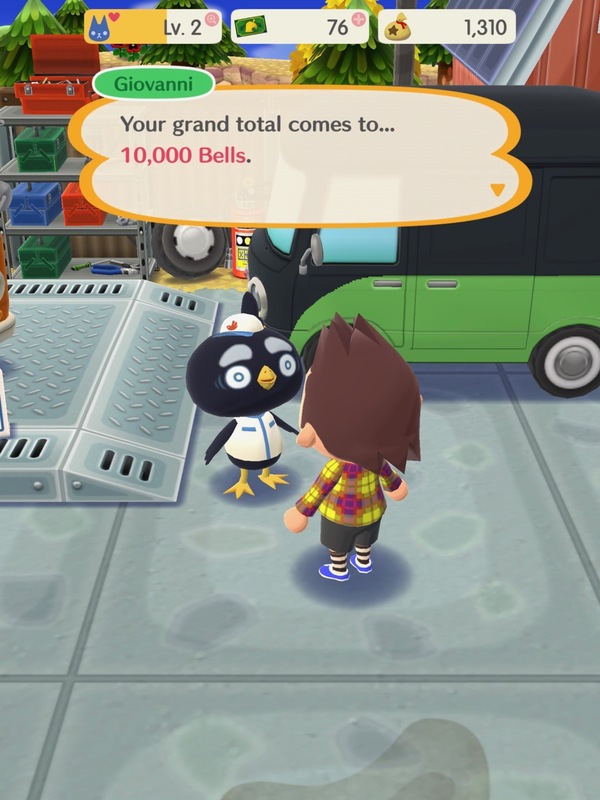 They’ll pay full Market Box price too (1,000 Bells) which helps to offset the growing costs of crafting and camper loans. For the truly rare finds, hoard them. For the uncommon finds, hold on to them but not at the expense of keeping a balanced inventory. I usually shoot for no more than five of any one type of uncommon in my inventory at any one time. Note: you could put these in your Market Box and sell them for the full suggested price but I would advise against this. Only your friends can buy what you put in the Market Box so unless you’re friends with a high roller, it’s likely to just sit there. Specifically, fruit you only have one tree of. There are six different kinds of fruit and for three of them, you’ll only have one tree that grows it. Trees take three hours to grow another three pieces of fruit so store up on these. Pro tip: you can shake fruit off a tree and leave it on the ground. It won’t rot or time out so you can always have six pieces of fruit on hand (three on the tree, three on the ground). Shells are deposited on the beach in a random fashion at random intervals which makes it hard to farm them. Keep several of each kind in your inventory to stave off running out. Animal visitors are assigned a personality type, just like you were at the very start of the game. Early on, their personality type doesn’t matter (just like yours doesn’t). You want cotton over all other things to finish crafting the first tier of amenities. Visitor personalities will matter once you start crafting the second tier of amenities. These require Essences to craft and Essences are pretty rare. You earn them either through completing goals (Timed and Stretch) and leveling up your friendships with your visitors. That sounds like a lot but every time you want to increase the level of your amenity requires another batch of Essences. The best way to manage this is problem is, once you’ve unlocked all four second-tier amenities, to pick two of the personality types and focus on them exclusively. Only invite to your campsite visitors with those two types. Prioritize requests from these types over the others. That way, you spend more of your time getting the Essences you need for later on. Don’t worry, you’ll still earn enough Essences from the other two types to make whatever you’ll absolutely need to craft. You just won’t have to worry so much about running out of the ones you really need a horde of. Here’s the deal with your camper/van: it doesn’t do much other than offer another customization option but primarily functions as a Bell sink. Around level 7, you’ll be offered to expand your van. This will transform it from a VW-esque bus to a Winnebago-like camper (you can change back to the VW bus if you so choose). Getting this upgrade will unlock more paint designs but that’s it. From them on, the birds at OK Motors will offer to expand the interior volume and then loan you the money to pay for it. As any experienced Animal Crossing player knows, these loans just keep coming and rise to enormous amounts. If you really want to deck out the interior of your van, more power to you but know that for anyone else to see it, they have to actively enter your camper when visiting your campsite. The interior is otherwise invisible. I’ve paid off enough loans to unlock the 150,000 Bells loan. That’s a lot of time and energy invested in something mostly invisible to anyone but you. I say if you have the cash for it, go nuts. Otherwise, you can ignore it. What’s up with Shovelstrike Quarry? The quarry is a daily scratch-off game. If you get five of your fellow players to assist you, you get five chances to hit rocks and find valuables. There’s about twenty rocks to choose from and they each contain either (in ascending order of value) silver, gold, or some mineral (ruby, sapphire, emerald). There’s no way to tell what’s inside each rock. Doing poorly (all silver) will net you about 200-300 bells. Doing well will net you up to 2,000 bells. Do note the icon floating above Shovelstrike Quarry on the Map. This is the bonus you’ll earn just for entering and it changes every three hours. It rotates between Essences, crafting materials, and Bells. Sometimes it’s worth it just to wait another hour to see if a more valuable reward comes up before heading in. Also, do not use Leaf Tickets just to get into the Quarry as it’s absolutely not worth that price. 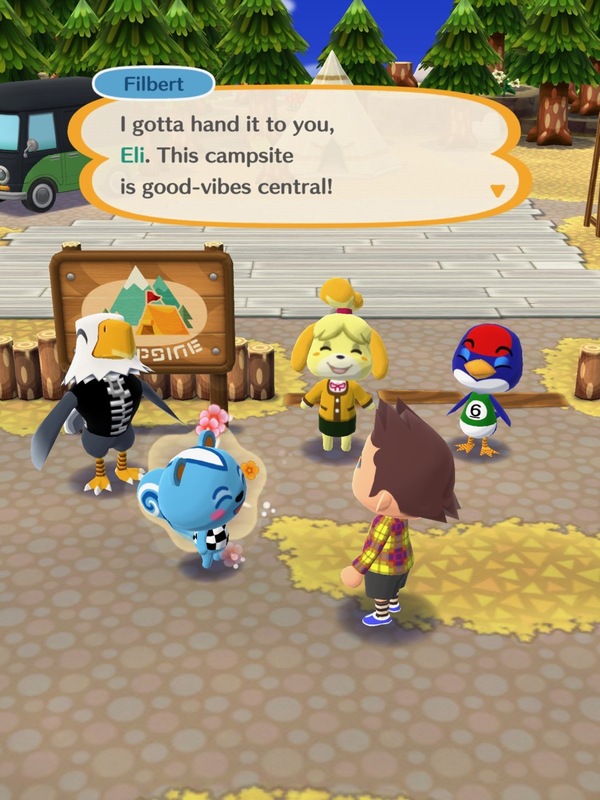 Veteran Animal Crossing players will no doubt note the absence of many features that are staples of the franchise. Pocket Camp is very much about capturing the feel of previous Animal Crossing games in a mobile freemium game. Nintendo may update the game with other aspects of the Animal Crossing franchise. Code divers have already noted references to flowers and gardening along with a host of structures and locations currently absent in the game. Whether that means these will be added at a later date are an open question. But that doesn’t mean some old Animal Crossing tips still don’t apply. Shaking non-fruit trees will still occasionally drop a bag of Bells. No word on if angry bees are also lurking in trees.